CasinoBonusNews → Casinos → "Black Diamond Casino review"
The online casino that we are going to review today is a USA friendly site called Black Diamond Casino. They are very popular in the US market. You might know that they have switched software providers a few times, with the final switch coming back to TopGame when they made the commitment to stay in the US market. Owned and operated by Deckmedia, you know that they will be a 100% legit and well run online casino, as are all the other Deckmedia properties. Now lets look at the software overview of BlackDiamond Casino. As we have mentioned already, it is powered by TopGame, which has stunning graphics and very solid gameplay. All of your all time favorite slots game make an appearance here at Blackdiamond and the table games are well presented as well. Most importantly, all the game play is crisp and smooth, and everything has been backed by a 3rd party auditor. There is a large selection of games at Black Diamond Casino, with a heavy leaning towards 3-reel and 5-reel slots. There is also blackjack, keno, roulette, European roulette, and a few other table and scratch games. For good measure there is also several variations of video poker, so pick your poison because Black Diamond Casino online is sure to have it on tap. There bread and butter is indeed in the video and classic slot machines, with over 105+ different selections to choose from, you won’t be getting bored anytime soon at Black Diamond. Black Diamond Casino always has and will continue to take players from the USA. Casino patrons who are American will have no trouble depositing on and cashing out in a timely fashion. Check later on in this casino review for the full list of deposit methods available to you as an American. With their huge slots selection, they have become one of the most popular USA friendly casinos out there, and have been for a very long time now. 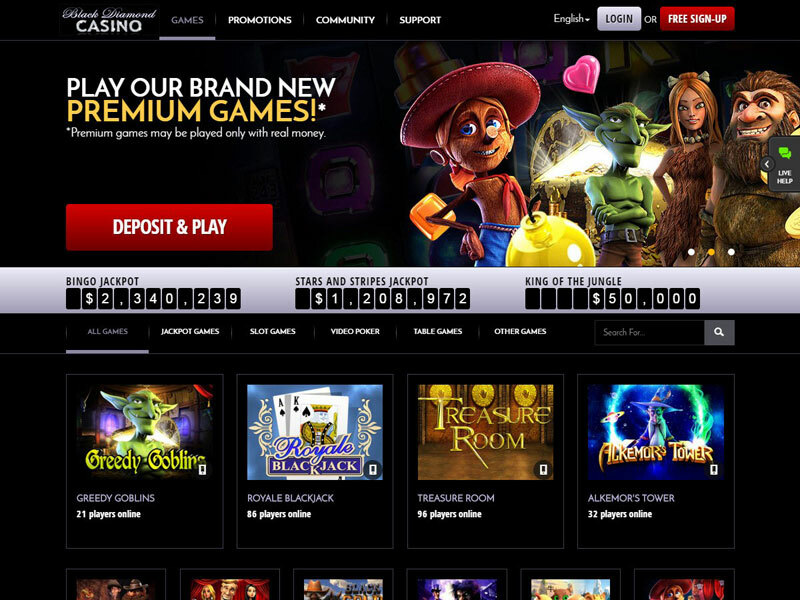 As you can see from the special landing page at Black Diamond, you can get up to a $999 bonus from joining their casino and making a real money deposit. That is one of the top end bonuses, especially for those online casinos that accept patrons from the USA. You can refer to the official Black Diamond site for all of the bonus terms and regulations. There are different bonuses depending if it is your first, second or third deposit. Your first deposit is a 200% match bonus up to $200 which is pretty great for a first deposit. If you want to make another one you can claim a bonus of 100% up to $100 for free. On your third deposit you can get a reload bonus as well. Once again it goes back up to 200% up to $200, followed by a 4th deposit bonus of 50% up to $499. That last one will certainly wet the beaks of some of you high rollers out there. You have plenty of ways to get money on and off Black Diamond casino. You can easily use your Visa, Mastercard and American Express credit cards, QuickCash, iDeal, EcoCard, Moneybookers, and Neteller, etc. You can also cashout using a check or bank wire. They are also very quick at cashing out your winnings, an aspect that is very important to a lot of people. 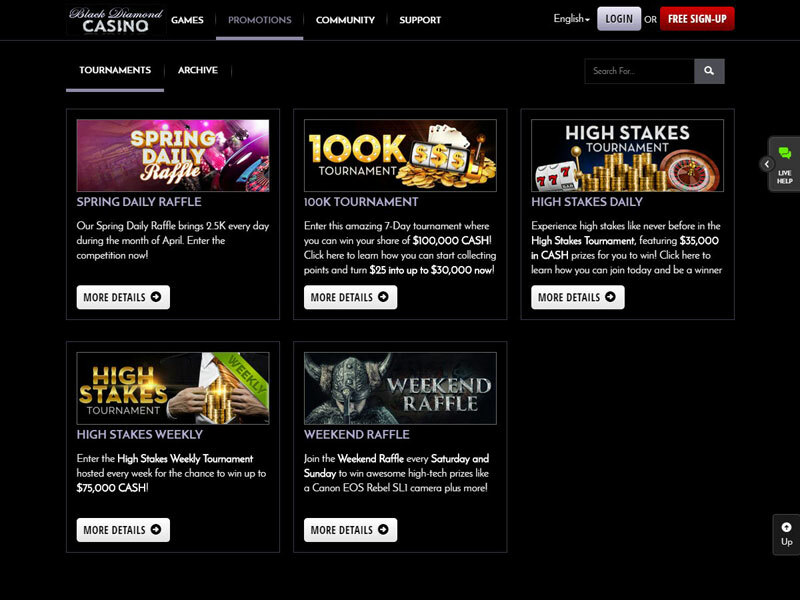 As with all of the Deckmedia run online casinos, the customer support at Black Diamond Casino is superb as well. You can contact them at anytime of day or night and get a very timely response. They have support via fax, live chat, email and during business hours by phone. 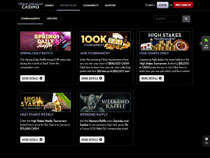 As you can see, Black Diamond Casino is one of the most highly visited USA friendly online casinos for good reasons. They are solid and perform well in every category, giving enough to current patrons that they always come back for more, and offering great promos for all new players to join the site. If you’ve never gambled here before, it would definitely be wise to take advantage of the high first deposit bonus that you can get by doing so. Good luck at Black Diamond!